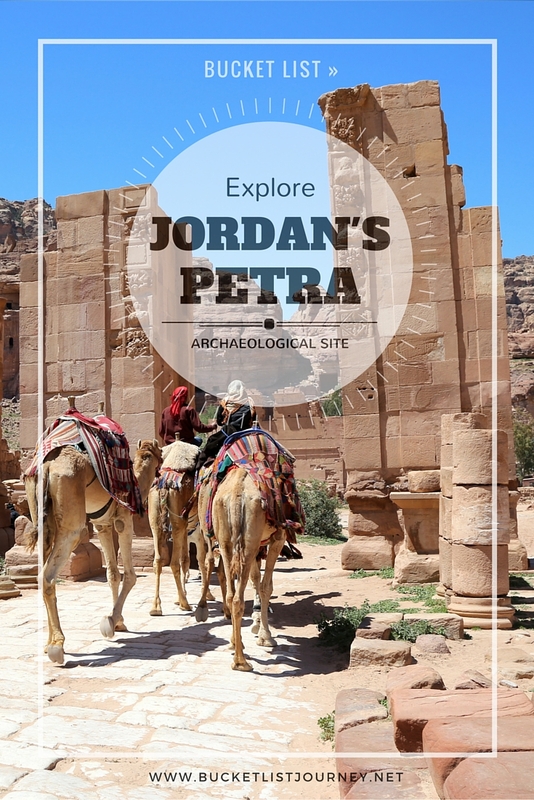 I didn’t know much about Petra prior to walking through the front gate, except that it was the archaeological site in Jordan’s southwestern desert that appeared in Indiana Jones and The Last Crusade. Travelers flock to the ancient Treasury (Al Khazneh) building that housed the Holy Grail in the famous flick. 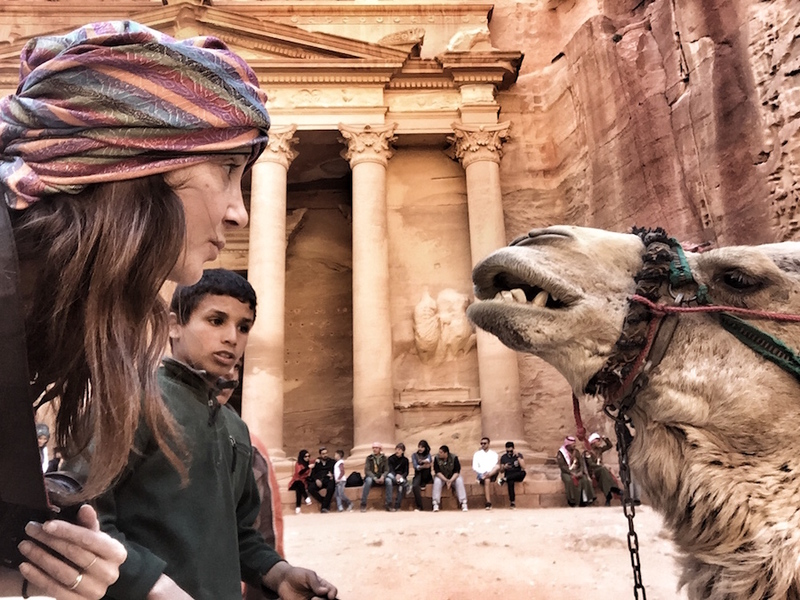 Do a Google search for Petra and 90% of the photos will be of this iconic sandstone temple facade, camels lying on the dusty ground before it. But, there is so much more to Petra. 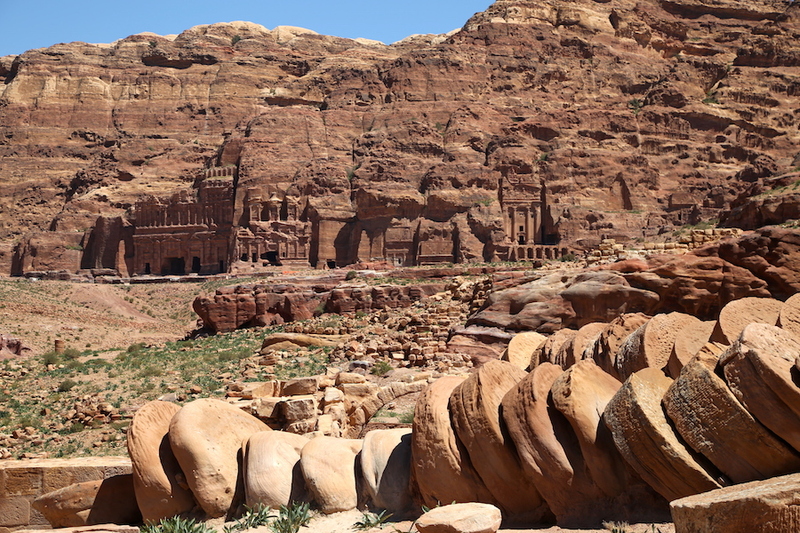 The UNESCO ancient city of Petra was carved into the rose colored sandstone cliffs by the Nabataeans as early as 312BC. There are over 30 incredible sites spread over 60 square kilometers, from temples to tombs to elaborate buildings. Petra is about a 3-hour drive from the capital city of Amman, though we had made our way from Wadi Feynan where we spent one unbelievable night at the Feynan Ecolodge. This hotel ranked as one of the top 25 ecolodges in the world by National Geographic and it was easy to see why. The candle-lit complex sits in the middle of picturesque desert landscape perfect for relaxing, hiking and stargazing. In fact, the evening we were there a Beduoin staff member took us to the pitch black roof-top where he gave us an astronomy lesson using a laser pointer. The Orion constellation could be perfectly seen. In the morning, three tattered 4WD pickup trucks waited for us outside the lodge. Our drivers were Bedouin men from a nearby community. 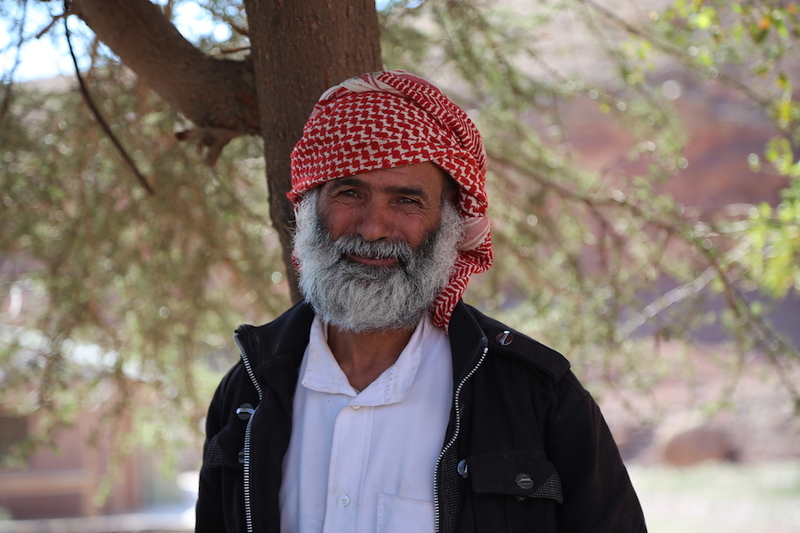 This semi-nomadic group inhabits the Jordan desert and when possible Feynan Ecolodge uses their services to support the local people. The journey to Petra was rugged. This was not the normal road, we were taking an offroad shortcut that was said to knock off an hour from the normal three hour trip. We kept nervously laughing/screaming when the ride got too crazy, which our non-English speaking driver mistook for us wanting him to go faster. Eek! We were crossing our fingers the entire time. We reached Petra just as night began to fall, in perfect time for a preview of the archaeological site. Three days a week visitors can attend Petra at Night, where over 1,500 candles light the mile trek from the Siq to the Treasury, an elaborate two-story tomb. We had arrived just in time to participate. A group of roughly two hundred people started at the visitor center and walked through the narrow rock fissures that were only lit by candlelight. Not having seen Petra in the daylight, walking through the Siq was a very mysterious experience. We were surround by darkness. After a half hour the large group of us reached the Treasury where burning candles placed in paper bags lit the surreal facade. We sat on thin mats that had been placed on the ground, and a Bedouin musician played music as we marveled at this magical part of the rose city. We started early the next morning for a view of Petra in the daylight, beginning with the same route as Petra at Night — through the Siq and to the Treasury. Though a donkey, a horse or a camel were options, we walked just like the evening before. The difference this time was that we could see the dramatic burnt-orange stone that surrounded us. It became quickly evident why this was one of Jordan’s most valuable treasure. At the Treasury, we stopped for a slew of camel selfies. Beyond the Treasury we opted to continue on the popular Classic Trail that passes by the Street of Facades, the Theater, countless tombs and through the Arch. As we strolled, funny children were offering up rides on “air-conditioned” donkeys or camels, while vendors were peddling bracelets for 1 dinar and souvenir stands sold glass bottles filled with artistic layers of sand. After 2 1/2 hours we reached Basin Street restaurant, a place to rest and get a mediocre buffet lunch filled with Jordanian dishes. From here you can choose to carry on northwest for another 45 minutes (uphill) to see the Monastery or turn around, head back towards the visitor center and explore hiking paths off the main trail. Due to limited time, I chose the latter of the two. I slowly walked back towards the Siq, taking random side trails along the way — climbing ruins and stepping foot where the Nabataeans so many years before. Sitting on top of a rock overlooking ancient ruins, I was grateful for the opportunity to travel to such a place, yet disappointed that I only had one day to explore it. It was not nearly long enough. Jordan is a mostly Muslim country located in the Middle East, sharing its borders with Israel, Syria, Saudi Arabia and Iraq. 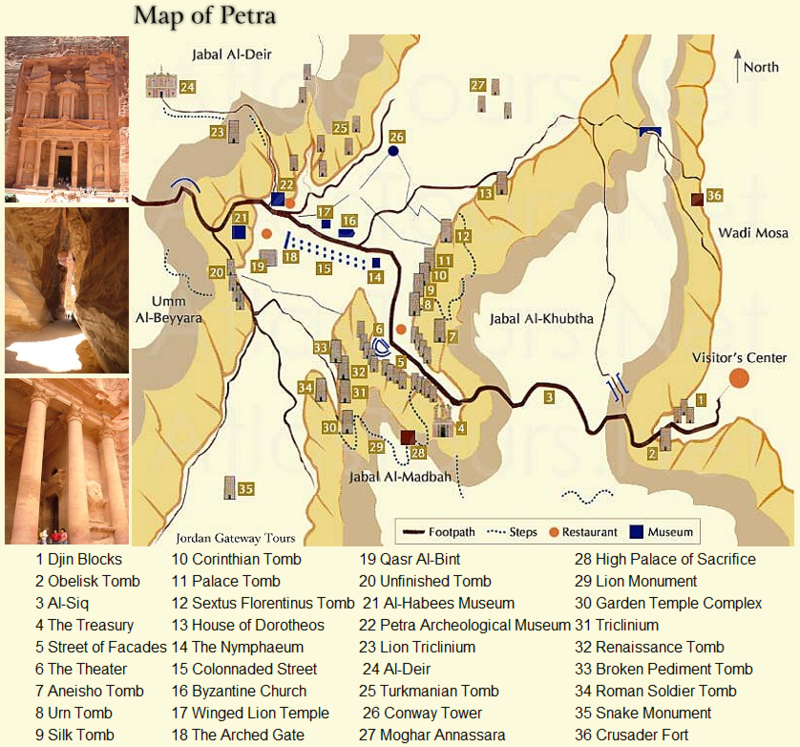 Petra is a 60 square kilometer archaeological site located in Jordan’s southwestern desert. There are regular flights on Jordan’s national carrier, Royal Jordanian, that fly into Queen Alia International Airport located just south of Amman. There are regular flights from the U.S. on Jordan’s national carrier, Royal Jordanian, plus several other international carriers that will fly into Queen Alia International Airport located just south of Amman. 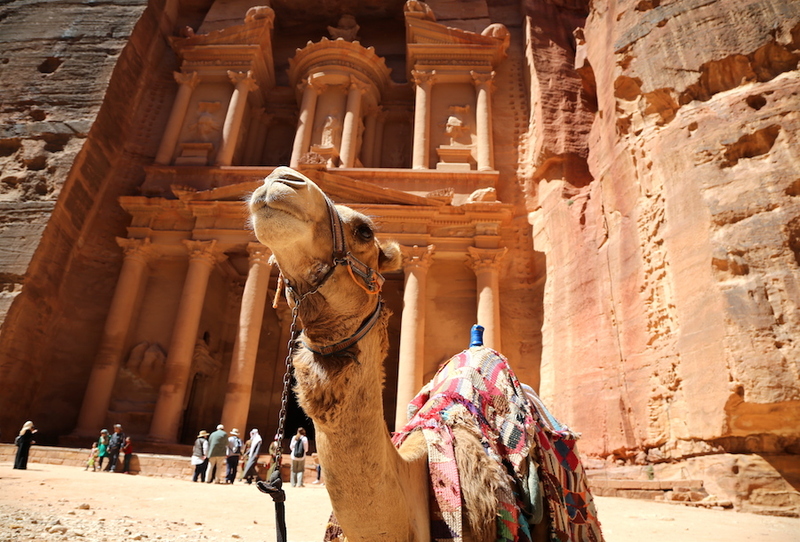 From Amman, Petra is about a 3 hour drive or you can take a bus. A JETT bus runs daily for around $14 USD and will drop you off in Petra. Viator offers a private transfer from the airport to Petra for $68.75 USD. You can also get to Petra by renting a car, which can be the most flexible way to explore. The airport has numerous companies, many of which are also found in America (Dollar, Thrifty, Budget, etc. ), so do a search on a site like Expedia (www.expedia.com) or Skyscanner (www.skyscanner.com) who will compare the rates from different car rental companies. The cost starts at around $40 USD per day. The roads are in good condition and the important signage will be in English as well as Arabic, but make sure you have a good map or GPS. Plug C / D / F / G / J, 230v. Most outlets will be the same as the European with two round prongs. You will need an adapter and a converter if your devices are not dual voltage. I used the Insten Universal Adapter with no problem. The best time to visit Petra is from March to May or late September to November when the temperatures are moderate and rainfall is at a minimum. In the summertime the temperatures can soar up to 115 degrees, which will make exploring the desert next to impossible. 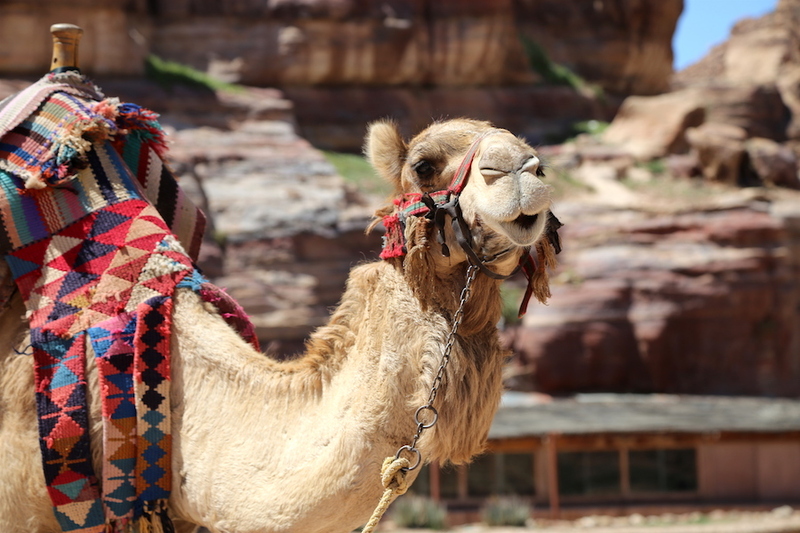 In the winter the daytime temperatures may be comfortable in the mid 60s, but the evenings will get down to the low 40s, which will be chilly if you are planning on doing Petra at Night. It is best to rent a hotel (see recommended hotels below) in the nearby Wadi Musa, so that you can easily spend several days exploring. One day is not enough!! Keep in mind that Petra by Night only runs on Monday, Wednesday and Thursday, so plan accordingly. 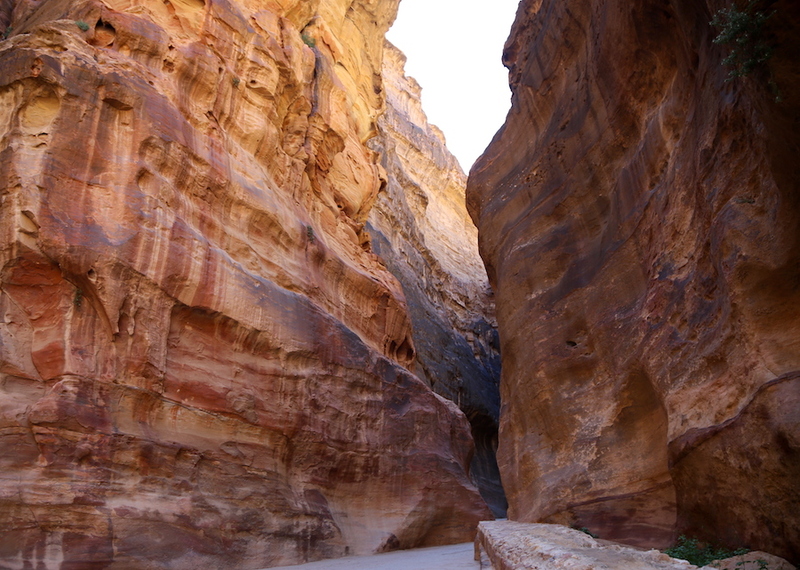 If you are limited on time, Viator offers a Petra Day-Trip from Amman. Try takings a cooking class at Petra Kitchen (www.petrakitchen.com) and then eat your deliciously homemade Jordanian meal. Don’t want to cook your own meal? Try the traditional lamb mansaf at the low-key Reem Baladi (Mid-Town on Tourist Street; Petra – Wadi Musa; tel. 0777312455). It’s where the locals go! If you’re not that hungry, head over to TimeOut (Tourist Street, Petra – Wadi Musa; tel. 962777809432) where you can get snacks and coffee while smoking shisha. Make sure to drink more water than you think you need. You are in the desert where it can be easy to get dehydrated. It doesn’t hurt to stop by the pharmacy to pick up a dehydration powder that can easily be put into your water in case you feel dizzy. Petra is massive and can not be seen in just one visit, This is especially true for photographers. 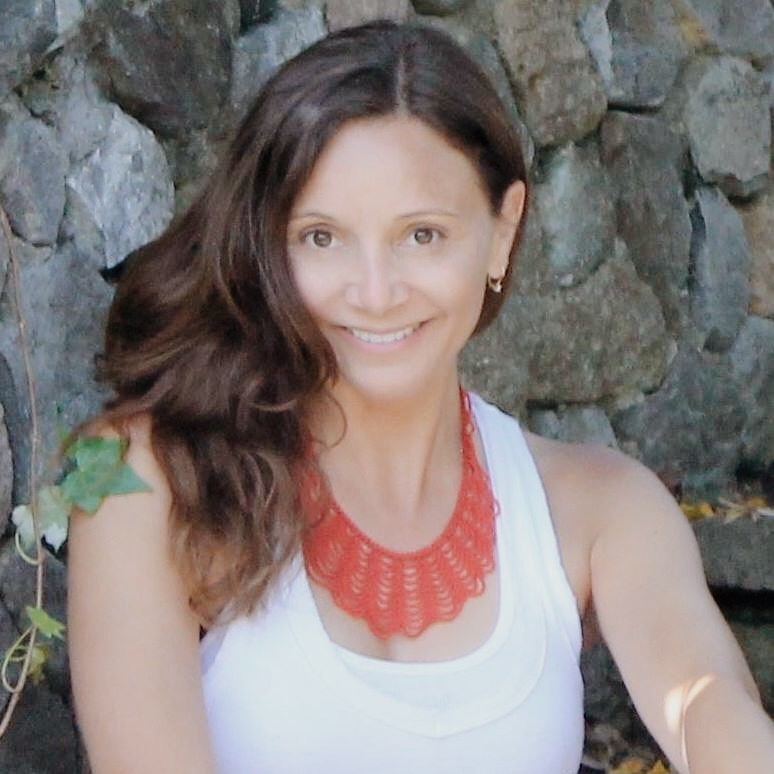 One day is good for the classic trail, but if you want to do other hiking trails plan for 2-3 days. Tripods are placed to the right of the treasury when visiting at night, try to get there first in order to get a good spot. Don’t remove anything from Petra; pottery shards, stones or plants. Restroom are limited, so make sure that you use every one you see! 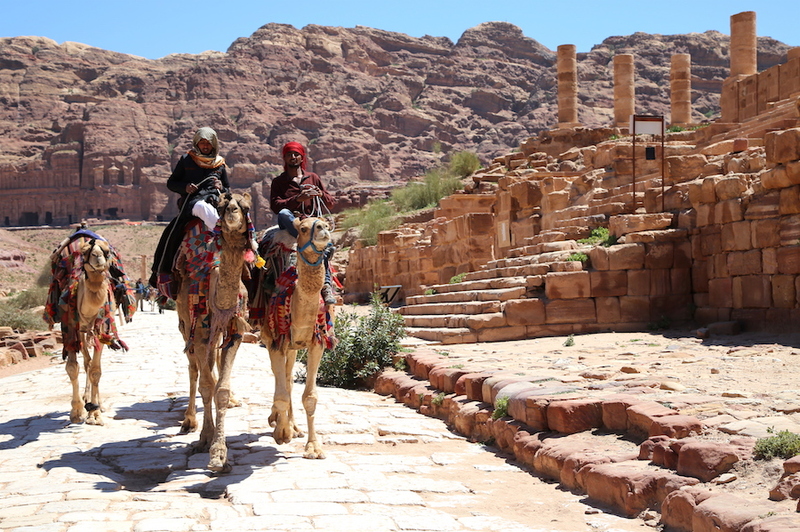 There is A LOT of walking in Petra, so use the other modes of transportation when available. Camel rides cost about 15-20 ($21-28 USD) dinar, donkeys around 7 dinar ($10 USD and horses with carts 25 dinar. A horse ride from the visitor center to the Siq is included in the ticket price, but tip 2-4 dinar ($3-5 USD). 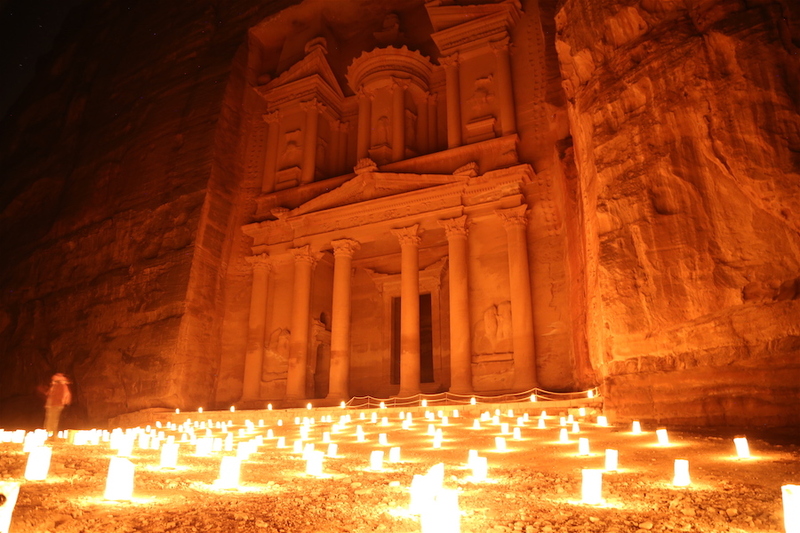 For the best photos at Petra at Night, hang out until the end until the crowds leaves. For general clothing tips read my post on “What to Wear to Jordan as a Woman Traveler“. 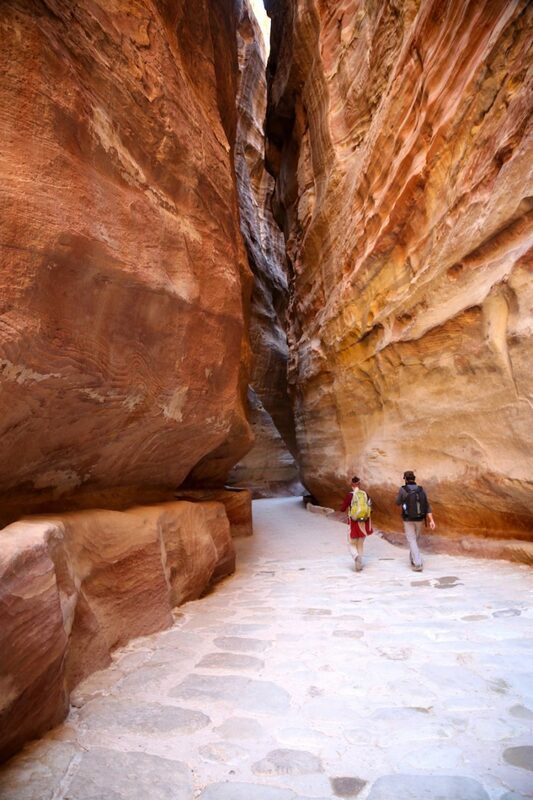 Pack a scarf or a hat and sunscreen because there is not much shade in Petra. Bring tissues, many times there’s no toilet paper in the restrooms throughout Jordan. If you plan on doing Petra at Night bring a flashlight to see the rugged ground you will be walking on. My Jordan Journey (www.myjordanjourney.com); Jordan Tourism Board (www.visitjordan.com), Visit Petra.